Vicki's Book Shelf | AnyMondayMorning--- Enjoying Life! See Vicki’s Latest book at Amazon. com! 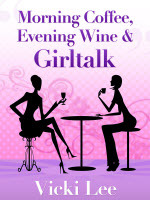 Written with humor, and input from Vicki’s network of girlfriends in the Baby Boomer Generation, they give advice from the viewpoint of women who wish they knew then what they know now! Told with personal anecdotes and stories, this book is perfect for all the women trying to juggle children, husbands, households, jobs and a very busy to-do list!